LAWRENCEVILLE, GA - In an announcement made today by the International League, Gwinnett Braves' outfielder Ronnier Mustelier has been selected to participate in the 29th Annual Sonic Automotive Triple-A All-Star Game, presented by Gildan. The game between the top players of the IL and the Pacific Coast League will take place on Wednesday, July 13 at BB&T Ballpark in Charlotte, NC, the home of the Charlotte Knights. Mustelier, a midseason All-Star for the first time at any level of affiliated baseball, was one of 17 players selected by the International League office for its 30-player roster. He is Gwinnett's lone representative and the G-Braves' first position player selected to the game since third baseman Phil Gosselin in 2014. The 31-year-old outfielder has batted .296 with 13 doubles, four triples, one home run, 31 runs scored, 33 RBIs and three stolen bases in 70 games with Gwinnett this season. As of June 29, Mustelier ranked among IL leaders in lowest TPA/SO ratio (3rd, 9.50), triples (T-6th) and batting (10th). 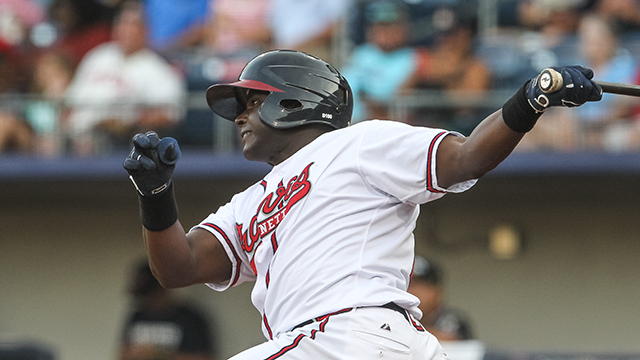 Born in Santiago de Cuba, Cuba, Mustelier was signed by the Atlanta Braves as a minor league free agent on November 24, 2015 after spending parts of the last two seasons playing in Mexico and Venezuela. In 400 career minor league games, he has batted .313 with 96 doubles, nine triples, 36 home runs, 230 runs scored, 233 RBIs and 41 stolen bases. Originally signed by the New York Yankees on June 7, 2011, he spent parts of four seasons (2011-14) in the Yankees' organization before joining the Braves. The 29th Annual Triple-A All-Star Game will be broadcast live on MLB Network, American Forces Network, MiLB.TV, and the Triple-A All-Star Game Radio Network beginning at 7:00 p.m. EST on July 13. The Gwinnett Braves are the Triple-A affiliate of the Atlanta Braves. Follow the G-Braves at GwinnettBraves.com, facebook.com/GwinnettBraves1 and twitter.com/GwinnettBraves. Tickets are on sale now at the Coolray Field Ticket Office, call 678-277-0340 or visit GwinnettBraves.com/tickets.